Scott Wade had spent the past nine seasons in the minors, without making the majors. Despite not making the bigs, Wade couldn't see himself doing anything else. Not then. He was still improving, he told The Chicago Tribune in spring 1993. "If you're hitting a buck (.100) and you're not doing anything, maybe," Wade told The Tribune. "But as long as you're getting better-I'm 29, but I'm probably stronger and faster than I was when I was drafted. "As long as you can keep doing it," Wade added to The Tribune, "why go out in the real world?" Wade kept doing it for three more years, finally forced into the real world in 1995 after 12 seasons in professional baseball. But he went into the real world never having improved enough to make the major leagues. 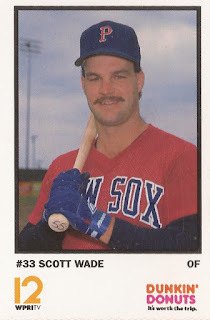 Wade's career began in 1984, selected by the Red Sox in the second round out of Oklahoma State. He played that season and the next at single-A Winter Haven, hitting .242 and .209 respectively. He made AA New Britain in 1986, improving his average to .266. He made AAA Pawtucket the next season, remaining at AAA for the rest of his career. The outfielder spent a total of four seasons at AAA Pawtucket. In 1988, Wade helped the Paw Sox to victories over Maine in a May 9-4 win and a July 7-4 contest with a home runs in each. In one May 1990 game, Wade knocked in the winning run with a single against Louisville. But in those four seasons, Wade would never hit better than .254 and 16 home runs. Those numbers came his first year in 1987. Wade moved on to the Phillies system for 1991, then the Blue Jays and Cubs in 1992. In spring training 1993 with the Cubs, had a game-winning single as a non-roster invitee. But, afterward, it was back to AAA, at Iowa. In 1993, Wade would go through three systems, starting with the Cubs, then head to the Mets and Twins AAA clubs. In 1994, it was 31 games with the Phillies at AAA Scranton. His final season came in 1995. Wade went into that spring as a replacement player for the team that drafted him, the Red Sox. In trying to introduce the replacement Red Sox, The Hartford Courant noted that Wade had worn a Red Sox uniform before, a Boston Red Sox uniform. But it was never in the majors, The Courant wrote, it was as an extra in the movie Major League II. Coming out of the strike, Wade returned to AAA, at Pawtucket. He played seven games there, and finally was unable to do it any longer. His career ended after a dozen seasons and without making the majors.